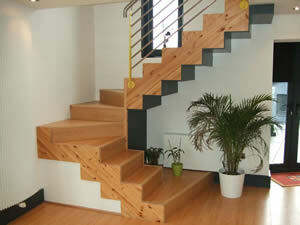 Designing an manufacturing showpiece stairs and balustrades are the Tiernans Joiner hallmark. Regardless of the complexity or the design brief our specialised knowledge and perfected techniques can and will craft a stunning staircase from the finest timbers for any residential or commercial project. We consult with you - our client to assist on designing the solution, selecting the type of timber to be used and then we take over the manufacturing process. Using highly developed laminating techniques we can accommodate seemingly impossible curves and fit them to the space required with pinpoint accuracy. We are with you throughout each stage from idea, to design, to timber selection then through to manufacture, transport, assembly, fitting and finishing the project. We are confident that whatever the demands we have the aptitude and skill levels necessary to complete a unique and elegant addition to any home or commercial premises.